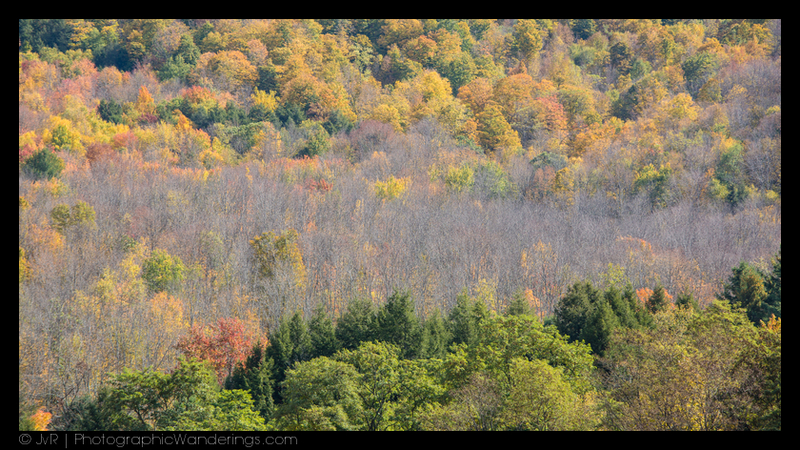 Spent the last few days driving around in the Catskill mountains of New York state, searching for opportunities to capture this year's fall foliage colors. This is a quick update on my experiences, so that others planning to travel to the Catskills can benefit from them. I'm by no means an experienced fall foliage shooter. I actually don't really have 'anything' with trees. I like wide open landscapes and low skies. That must be my Dutch heritage. With trees, I just tend to think they're in the way. Give me one tree on a hill over endless forests, at least when I have a camera in my hand. Otherwise, I do like that all those trees clean the air for us. Anyway, I'm not a natural at this, but I tried my best. Peak foliage hasn't hit yet, at least not in the lower elevations and in the southern section of the area. Higher elevations in the north are getting there and should be near perfect if not perfect over the upcoming Columbus Day weekend. So, routes 23 and 23A were good bets, while the more southern routes 28 and 28A gave me colors on the mountains in the background, but not much yet on the ground. Apparently, it has been pretty dry in the area recently, so many reservoirs and lakes aren't at full capacity and riverbeds are pretty disappointing, with tons of rocks but little water. Waterfalls, such as they are, are a trickle of what they could be. The Catskills are known for the great drives they offer, and it's a well-deserved reputation. For us photographers, it's sometimes a challenge to be able to stop on those drives. Smaller routes like 212 and 214 and the local roads offer plenty of opportunities to pull over, but in some of the most photogenic places, the larger routes like 23 and 23A offer no space to park and/or parking is illegal. There are parking areas, but you then end up with the vista that everyone else is also shooting with their mobile phones. Many areas are also off limits, as lakes and reservoirs are used for water supply or a particular nice vista is only visible from private land. Bringing a telezoom makes it possible to shoot the scene while standing just outside of the inaccessible area. In general, it's best to bring your full arsenal of lenses, as in some places you can get close enough to shoot with a wide or superwide lens. Oh, and bring a map. I know, it's a given, but I relied on my iPhone the first day and I got a phone that quickly drained its battery while not always offering me a map because of bad reception. Also, just drive around to see if you can find a nice foreground for the appealing background you can see from the main road. 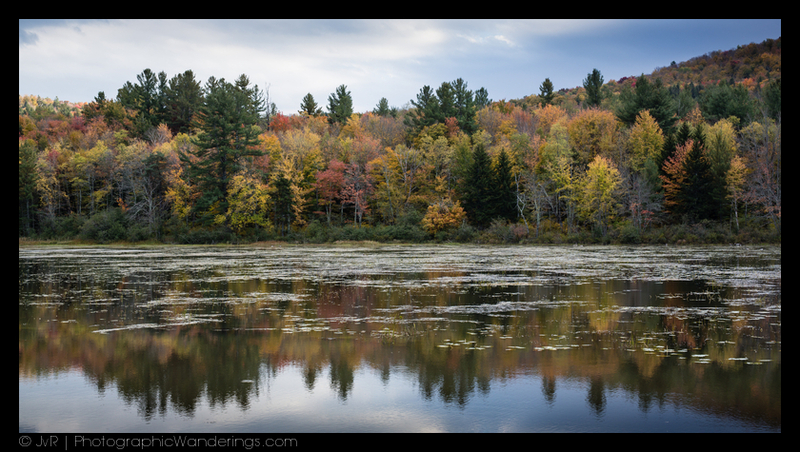 That's how I found the little lake in Tannersville, NY, featured below. Cooper Lake off Route 212 near Woodstock is also a great place to use as a foreground. Another place to try is the angler's access point to Esopus Creek on Route 28 between Phoenicia and Shandaken.